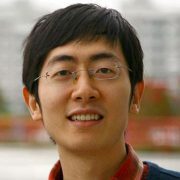 I am a Senior Research Manager in the Visual Computing Group at Microsoft Research Asia, Beijing, China. I got my MS degree from the Department of Electronic Engineering at Tsinghua University in 2005 and my Ph.D degree from Department of Computer Science & Engineering at the Hong Kong University of Science and Technology (HKUST) in 2009. Then, I joined Visual Computing Group at Microsoft Research Asia in August, 2009. My current research interests include: computer vision, applied machine learning and computational photography. See my website.